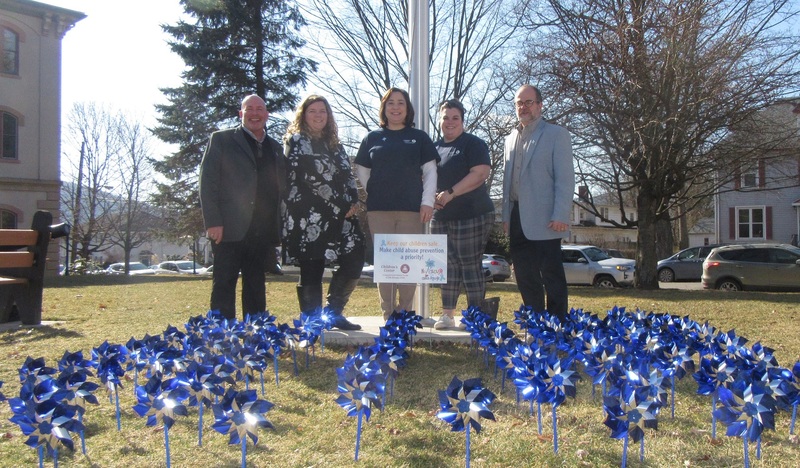 Family Service Association and Children & Youth Services managers from Susquehanna and Wyoming counties planted 86 pinwheels in the west courthouse lawn to mark Child Abuse Prevention Awareness Month. Participants included (above, from left) Howard Heise, Meagan Janiszewski, Janine Fortney, Kimberly Tuttle and Mike Zimmerman. 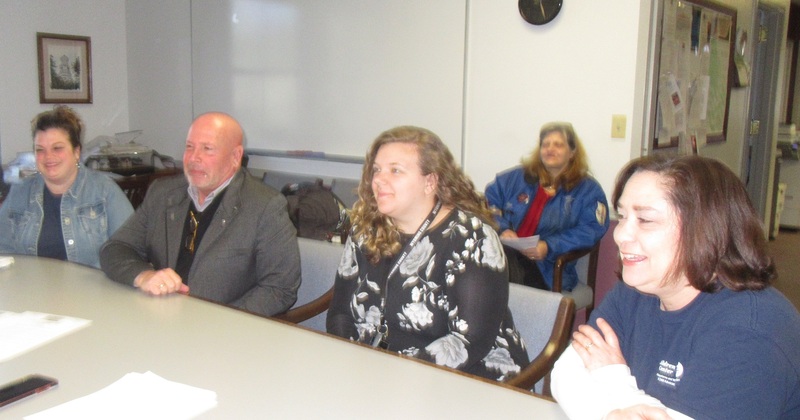 Three local agencies vied for the blessings of the Wyoming County Commissioners on Tuesday morning, and each was granted a proclamation to help promote awareness of varying causes. 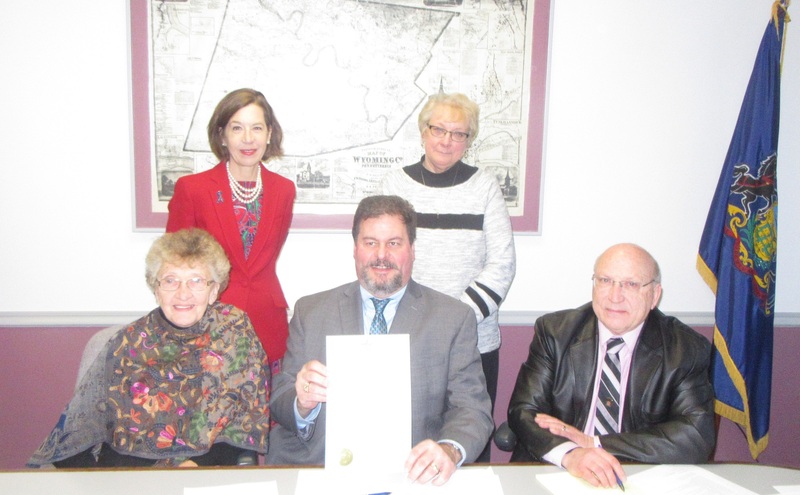 March was designated as Colon Cancer Awareness Month and Thursday, March 28 as CASUAL Day at the courthouse. April was recognized as both Child Abuse Prevention Awareness Month and 811 Safe Digging month. Karen Saunders (back, left) was on hand from the Northeast Regional Cancer Institute to share some statistics that were both encouraging and sobering. While the instances of colon cancer have dropped in the region, they remain well above the national average. Linda Stacknick (back, right), an administrative assistant at the courthouse, was cited for her annual efforts at getting all county employees to purchase T-shirts for CASUAL Day. This year’s maroon shirts are available in short and long sleeves and can also be purchased at One More Page Books on Tioga Street in Tunkhannock. Several representatives of the joint Children’s Center of Susquehanna and Wyoming Counties (above) attended the meeting for the reading of their proclamation and to plant 86 pinwheels on the courthouse lawn to signify the number of children who received services at the center in South Montrose for child abuse or neglect last year. Another 20 were treated for mental health issues. Family Service Association, the center’s parent organization, will sponsor a free screening of the movie “Babe” at the Dietrich Theater on April 13. Commissioner Judy Mead read highlights from the 811 Safe Digging proclamation, noting that the increasing amount of infrastructure in the area makes calling before you dig more important all the time. County EMA director Gene Dziak asked the commissioners to approve a purchase agreement for a “commodity flow” study. Trucks entering the county at various points will be monitored by Finley Emergency Consulting to document the types of potentially hazardous materials they carry, each designated by a specific placard. Dziak has applied for an $8,000 grant to cover the cost. “This is an important study,” Dziak remarked. “Next we do a vulnerability study. As an EMA, we are looking at ‘Do we have the equipment needed to mitigate circumstances in the even of a spill?’” In the meantime, Dziak indicated that he does believe that the county is in fact prepared, but the last study was conducted four years ago, and the transportation of substances such as sodium bicarbonate, anhydrous ammonia and diesel fuel fluctuates. Dziak also asked for approval of a Wyoming County Hazard Mitigation Plan, the cost of which is covered by a $49,000 PEMA grant. The plan, which is not yet complete, is good for five years once it is approved by the state and federal governments. At that point, municipal leaders across the county can adopt the county’s version at no cost to them or spend money to have their own plan developed. Dziak described the new plan as “a very intensive and detailed update” from the plan approved five years ago. Commissioner Tom Henry noted that the county has provided one dollar and fifty cents per plot for the past 37 years for 1,825 veterans’ grave sites registered with the county’s Bureau of Veterans Affairs. Additionally, the county has purchased an equal number of flags that are placed by volunteers. Deputy chief clerk Georgette Smith, who was sitting in for Bill Gaylord, suggested that the amount currently given by the county probably doesn’t even cover the cost of a single mowing. Commissioner Mike Stabinsky made a motion that the amount be increased to three dollars per plot, effective immediately, and Mead and Henry approved the action. Members of any cemetery association not currently receiving veterans’ grave assistance in Wyoming County are encouraged to apply through the Veterans Affairs office. The recent hires of Denise Herbert and Jessica Robinson as second deputy in the Prothonotary Office and data collector in the Assessment Office, respectively, were approved by the commissioners. Both positions are full-time with benefits. Alysha Gregory has been hired to a full-time position as an administrative assistant in the Sheriff’s Office. A vacancy on the Housing and Redevelopment Board has been filled by local business owner Pat Furneaux. Tina Henning accepted commissioner Stabinsky’s request that she fill a vacancy on the county’s Solid Waste Board. County planner Lynnelle Farber is seeking someone to fill a vacancy on the Planning Commission Board as per the recent resignation of Mike Irish. With so many people in attendance, commissioner Henry took the opportunity to ask for input on a question put to the commissioners by the Pennsylvania Game Commission (PGC) about whether or not to move the first day of antlerless deer season to the Saturday after Thanksgiving, rather than the following Monday. Opinions were clearly mixed but proved that the argument is a complex one. Some felt that bumping up hunting season by two days would result in additional traffic on an already busy holiday and shopping weekend. Others suggested that it might cut down on business at local restaurants and sporting goods stores from hunters who come from outside the area, while others felt it might help. Stabinksy stated that he is not in favor of the change because deer hunting on the first Monday after Thanksgiving has become a family tradition of its own that would cease to exist. The commissioners and audience were in general agreement that this move by the PGC is likely a precursor to the desire by some to allow hunting on Sundays. The commissioners approved an amendment to the county’s contract with Boswell Services to extend their coverage to the Wyoming County Prison. Prescription medications alone cost the prison $140,000 per year, and Boswell representatives have suggested that they could decrease that amount by 25 to 85 percent using Costar-approved providers. The best part about the agreement, Stabinsky maintained, is that the county can back out of the deal if the benefits don’t materialize.